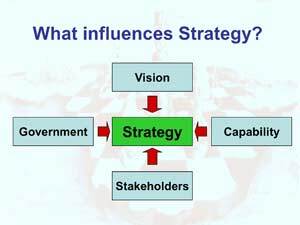 Many theories exist around the subject of “Strategy”. It is important to decide on a definition within an organisation. 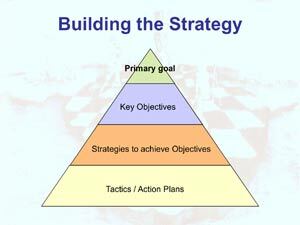 This makes sure that everyone understands the meaning of the different components of the strategy and how it affects them. It gives direction to the organisation. It ensures that focus is maintained. It empowers people to make decisions. It directs the allocation of resources. Vision: What the organisation stands for and what it hopes to achieve in the future. Mission: The reason for the organisation’s existence - it defines its business domain, in terms of basic product or service, customers, market need, technological field, or a combination of these. Strategic Objective: The few (2 to 6) key factors that will ensure that the Vision is achieved. 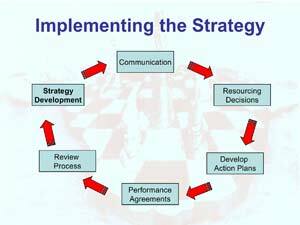 Strategy: The strategy describes “How” the strategic objectives will be achieved. Tactic / Activity: The tasks or activities related to the strategy. Once the Vision and the primary reason for the organisation’s existence have been agreed, the vision is cascaded down into a few Key Strategic Objectives which are cascaded into Strategies which are again cascaded down into Activities. If the process has been followed correctly then managers can focus on managing and delivering the activities, which will lead to the strategies being achieved; in turn the Key Strategic Objectives and finally the Vision will be achieved. Although a Vision may be bold and audacious, the strategy needs to be pragmatic if it is to work effectively. Vision: The reason for the existence of the organisation & what the organisation eventually wants to achieve. Government: Compliance with regulatory and/or constitutional requirements. Stakeholders: The key groups or entities that the organisation services or is responsible to. Implementation is an ongoing cycle. Business units then need to establish their own implementation plans to contribute towards the achievement of the overall strategy. Individuals are made accountable through the “Performance agreement” process. This also completes the communication process and everyone understands what must be done and why. The tactics or action plans usually form the basis of the performance agreements. Everyone understands what needs to be done. People focus on the important, rather that the urgent things. 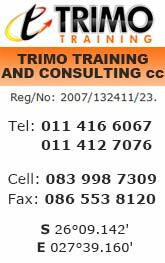 Training and development needs are identified early in the implementation process. Resource issues can be dealt with quickly.